Ronde pendant lamp has reference to the 1970s lighting design; however, in a modern interpretation. A unique detail is the opening on the top of the shade, so the light also casts a smooth gradient at the wire and ceiling. 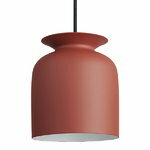 The hand-turned aluminum lamp shade with an ultra-matt lacquer almost makes it look as if it was made of ceramics. The Ronde pendant light is designed by Oliver Schick. The German designer Oliver Schick (b.1969) studied product design at HBK - University of Fine Arts in Saarbruecken. After graduating he worked as freelance for several different studios. Since 2005 he has run his own studio focusing on furniture, lightning and interior design.